– Ed Catmull, Co-Founder and President Pixar Animation, President Disney Animation, author Creativity Inc.
To Pixar and Beyond is part business book and part thriller — a tale that’s every bit as compelling as the ones Pixar tells in its blockbuster movies. It’s also incredibly inspirational, a story about a team that took big risks and reaped the rewards. I loved this book and could not put it down. After Steve Jobs was unceremoniously dismissed from Apple in the early 1990s and was struggling with NeXT, he turned his attention to a little‑known graphics company that he owned called Pixar. One day, out of the blue, Jobs called Lawrence Levy, a Harvard‑trained lawyer and executive to whom he had never spoken before, to persuade Levy to help him get Pixar off the ground. What Levy found was a company on the verge of failure. To Pixar and Beyond is the extraordinary story of what happened next: how, working closely with Jobs, Levy produced and implemented a most unusual plan that transformed Pixar into one of Hollywood’s greatest success stories. Set in the worlds of Silicon Valley and Hollywood, the book takes readers inside Pixar, Disney, law firms, and investment banks. 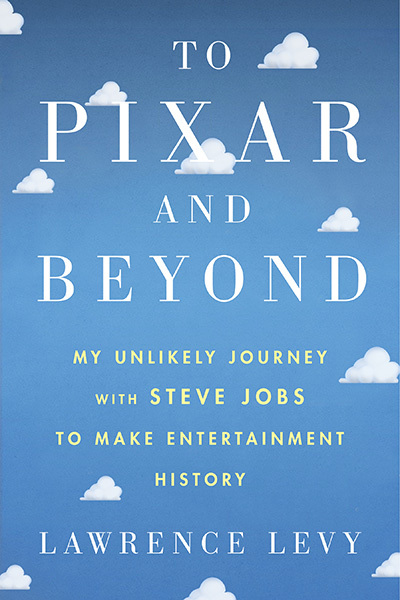 It provides an up‑close, firsthand account of Pixar’s amazing ascent, how it made creative choices, Levy’s enduring collaboration and friendship with Jobs, and how Levy came to see in Pixar deeper lessons that can apply to numerous aspects of our lives.